What’s taking so long on the SR 9 widening project? What’s the current status of the highway? We’ll hit a milestone the weekend of Nov. 2-3. That’s when crews will install a massive structure known as a signal bridge at 180th Street Southeast. The signal bridge will eventually hold all the new traffic signals and signs. The work requires a full closure of the intersection. You can get all the information about the closure on the project website. The final layer of pavement has been placed, except a four-block section between 180th Street Southeast and 176th Street Southeast. Although we’ll try to get it done this year, weather may prevent it from occurring until spring 2014. Crews are currently restriping the highway section by section. Two lanes in both directions are now open between 212th Street Southeast/SR 524 and 201st Street Southeast. Next up is the section from 201st Street Southeast to 188th Street Southeast, followed by 188th Street Southeast to 180th Street Southeast and then 180th Street Southeast to 176th Street Southeast. Specific striping dates depend on weather and the availability of a striping crew. Our construction update report will keep you informed about work plans that will affect traffic. Road construction work always has challenges. In coordination with our contractors, we plan schedules weeks, even months in advance to ensure the crews, equipment and resources are available. On SR 9 the contractor was all set to begin the final paving in early September which is traditionally one of the prime months to perform this work. What happened? The skies opened and September ended up as the wettest on record. We can’t pave highways in the rain. Projects throughout the region were rained out. Suddenly everyone’s carefully planned and coordinated schedules are being compressed into mere weeks, putting enormous pressure on private sector pavers and the striping companies. They’re now scrambling to reschedule everything into a much shorter time period. 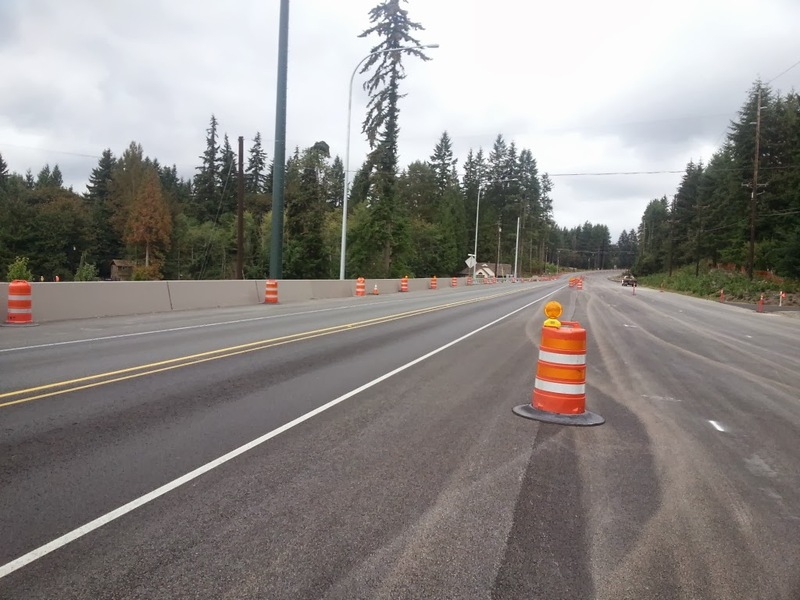 SR 9 is one of many WSDOT projects jockeying with local agencies and private companies for their time and attention. We’ll continue working on striping the project and the contractor is working hard to bring in additional resources. Over the next couple months, drivers should be prepared for lane closures as crews begin building the raised center median and U-turn locations. We hoped to have the entire project completed this fall, but some work will have to wait until next spring. We appreciate the patience and understanding of people who use SR 9 through the area. WSDOT remains committed to delivering a well-constructed highway that will serve the area for many years to come. This entry was posted on Thursday, October 31, 2013 at 12:37 PM and is filed under 180th Street Southeast, Clearview, restriping, signal bridge, SR 9, State Route 9, striping. You can follow any responses to this entry through the RSS 2.0. You can leave a response.